Joan Roca was the master behind the special menu that the Elton John AIDS Foundation served during its traditional charitable Oscars viewing gala. Nearly one thousand guests enjoyed the creations of El Celler de Can Roca, which combined some of their traditional family dishes and others incorporating local California produce. “This is an opportunity to showcase our work at the restaurant, but also to shine the spotlight on Spanish cuisine,” said Joan Roca. The involvement of BBVA’s brand ambassadors in one of the year’s top events in Los Angeles was possible thanks to the partnership between BBVA Compass, the U.S. franchise of the Spanish bank, and the Elton John Foundation. On Sunday March 4, the global capital of the film industry will once again don formal dress to announce its highest honors. During the ceremony, celebrities will attend a number of parties but without a doubt, one of the most popular and long-awaited will be the charity dinner hosted by Elton John each year to collect funds for his foundation. This year, the Roca brothers, the celebrated restaurateurs of Girona, will be in charge of the preparing a special menu for the occasion – a menu not just for the stars, but for a good cause. Every year, the Elton John AIDS Foundation holds the Oscars Viewing Party to raise funds for the fight against AIDS. This year, the almost 1,000 guests attending the charitable dinner were treated to a Spanish-flavored menu, prepared specifically for the occasion by the geniuses behind El Celler de Can Roca, one of the world’s best restaurants. 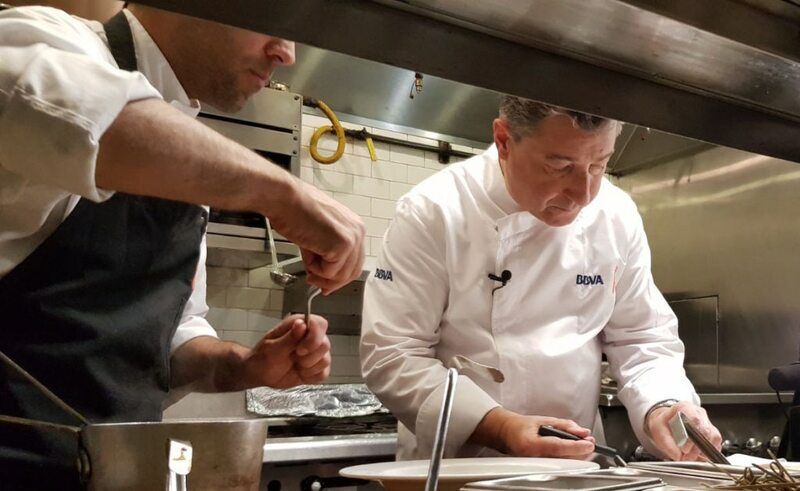 “The opportunity came up thanks to BBVA’s collaboration with the Elton John AIDS Foundation and El Celler,” explained Joan Roca. “Being here, for us, is a recognition of years of effort. It’s an opportunity to showcase our work at the restaurant, but also to shine the spotlight on Spanish cuisine, where there’s a lot of talent,” said Joan Roca. A challenge they gladly accepted and that’s kept them busy for the past six months. “The idea was to use a combination of local produce and some of the Spanish products you can find here, such as Manchego cheese, olive oil or sherry vinegar,” explained the eldest of the Roca brothers. The brothers are already familiar with the region from their visits to the U.S. as part of the international BBVA-sponsored tours they’ve embarked in. The menu that Elton John and his guests enjoyed started with truffle brioches and poularde cannelloni with truffle sauce – one of the restaurant’s traditional family recipes, which pays homage to their Catalan heritage. Then came a seasonal vegetable consommé with a fennel emulsion, seasonal flowers, sprouts, scallops and truffles; and sea breamwith Chardonnay sauce and lemon, truffle and hazelnut gnocchi. And to finish things off, a filet mignon with Priorate red wine, olive oil mashed potatoes and farmers market vegetable puff pastry and arugula salad with Comté cheese, pickled onions and curry-coated walnuts. 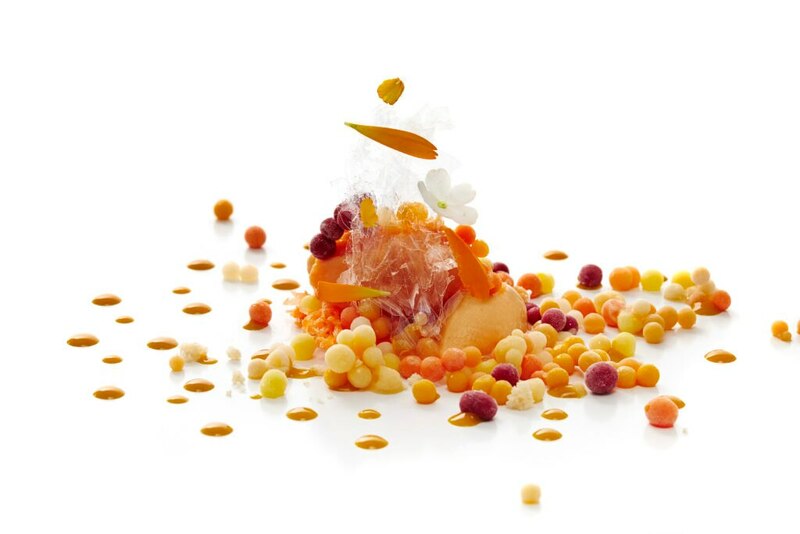 For desert, an adaptation of Jordi Roca’s orange chromaticism provided a stellar finale. The life of a salmon is a round-trip journey. Immediately after birth, it travels down river to the sea, where it lives until the time comes to procreate. The salmon them swims upriver, overcoming all obstacles, and reaches the same spot where its journey began – a point of departure to which it arrives enriched from everything it learned on the way, and determined to leave a mark on its birthplace.